HOW LONG DOES IT TAKE FOR BLINDS AND DRAPERIES TO ARRIVE? All products are custom made to your exact window measurements and some take longer to make and ship to us than others. Depending on the product that you order, blinds and shades typically take two to three weeks to arrive once the order is placed. Shutters and draperies can take four to six weeks to arrive. Once your order arrives, we will call you to set up an installation time. CAN I MEASURE BLINDS AND SHUTTERS MYSELF? Yes, you can measure yourself if you feel confident in your own measurements. If the blinds do not fit, it can cost you a lot of money as they are custom and can not be returned. Check out how to measure for some basic instructions. If we do not measure we do not install as we have found there to be too many issues. WHY DO YOU DO THE BLIND MEASURING AND INSTALLING ? 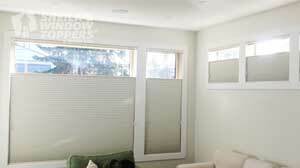 With many types of window treatments exact and knowledgeable measuring is critical. Depending upon what type of product is being put into the window, measurements are take differently. Sheila’s Window Toppers’ Design Consultants measure with high end lasers for the most accurate of measurements to ensure a great fit. Often a blind, shade or shutter may have to be leveled or tweaked at installation to ensure it operates properly. Our Certified Installers have extensive training to make certain your window coverings are installed according to the manufacturer’s requirements. If you plan on installing your own window coverings we do not measure for you. ARE YOUR WINDOW COVERING BLIND PRICES COMPETITIVE? Yes, when you look at the combination of what we offer, quality service, expertise, product knowledge and selection, professional measuring and installation, we believe our prices are competitive. You can always find a product at a lower price, but it normally comes with the same type of service. HOW DO I DECIDE WHICH BRAND OF BLINDS TO PURCHASE? At Sheila’s Window Toppers & More we carry a number of Manufacturers and give recommendations based on your budget and your requirements. Our knowledgeable staff will show you your choices based on questions they will ask you. For instance you may require blackout for bedrooms, heat control in specific windows and a less expensive product for your basement. If you let us know your requirements and budget, we can help you select the appropriate window coverings for your home. With our Design experience, product knowledge and professional training our staff will be able to walk you through the decision-making process to find the perfect solution for your window coverings to fit within your budget. WHAT IS THE BEST WAY TO WORK WITH YOUR HUNTER DOUGLAS SHOWROOM? We recommend that you visit our Hunter Douglas Showroom first, you will probably be surprised by the variety of products and lifting systems available. Our large display of blinds and shades let you see, touch and operate window fashions up close and personal, and our knowledgeable design consultants will walk you through your choices. Bring in some rough measurements, we will also be able to give you an idea of pricing on various products. Your showroom visit will help you make a better decision about what to buy. Then, a Designer will meet with you in your home to help you finalize your window covering selections and colors ensuring that everything you order perfectly compliments your home decor and meets your functional needs. Measurements will be taken to ensure that everything fits correctly for when your blinds are professionally installed. WHEN AND HOW DO I PAY FOR BLINDS AND WINDOW COVERINGS? A payment of half is required at the time the order is placed. The balance is due at the installation of your window coverings. When the final payment is made at the conclusion of the installation, you are required to give the installer a cheque for the balance owing prior to the installer leaving your home. If you will be paying for your blinds with a cheque or debit, we offer a larger discount than if you would like to pay with a credit card. DO YOU OFFER A MORE COMPLETE SELECTION OF WINDOW COVERINGS? Sheila’s Window Toppers is a Hunter Douglas ShowCase Dealer thus we have a larger selection of Hunter Douglas Window Coverings than you will find with a home based dealer. Besides the regular line of Hunter Douglas products, our Hunter Douglas Showroom showcases the Alustra Collection as well as the Designer Roman Shade Collection. Our Showroom also displays Shade-O-Matic and Graber, two other name brand manufacturers of quality blinds, shades and shutters. Sheila’s Window Toppers also has displays of valances and draperies along with thousands of fabrics to select from for your custom draperies. We often recommend draperies or valances to add color or your personal style to a room. Often clients begin with the basics of having blinds, shades or shutters fitted for privacy and light control and then add draperies as their budget allows. WHY SHOULD I BUY BLINDS FROM SHEILAS WINDOW TOPPERS? It is always best to buy from a reputable Company, with many years experience. Sheila’s Window Toppers has been serving Calgary and area for over 25 years and have the reviews from happy customers to prove it. We have won the HomeStars Best Shutter and Blind Company in Calgary for the last 5 years in a row, based on what customers say about Window Covering Companies in Calgary. You will have piece of mind buying from us because our highly trained staff is up to date on all the current window fashions and are knowledgeable on measuring and finding the correct product for your needs. We take pride in our reputation for great customer service and are committed to providing you with a positive shopping experience.